A customer commissioned this 3 x 4 traditional grid t-shirt quilt as a wedding present for her son. The t-shirts chronicle his participation in various sports activities from middle school through early adulthood, as well as t-shirts that hold special meaning for him and his new bride’s family. 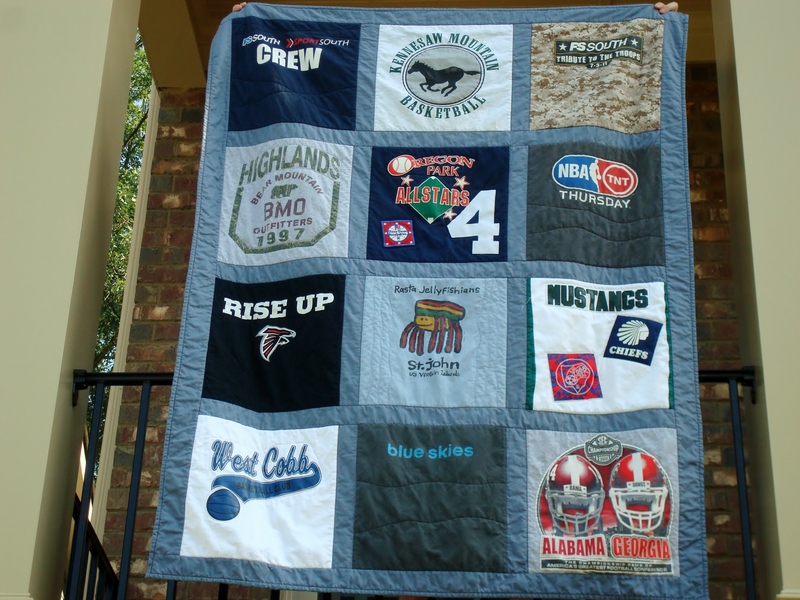 Sixteen shirts were actually used in this quilt, with patches and logos included as a part of the 12 blocks. The quilt was ditch quilted along the sashing and each block individually quilted around the logos. My customer specifically requested a “drapey” quilt, so the interior block quilting is deliberately kept to a minimum since dense quilting results in a stiffer quilt. She was so happy with the finished product.